Ipana was a very popular toothpaste brand introduced by the Bristol-Myers Company in 1901. Ipana quickly became a runaway success as the first toothpaste to include a disinfectant in its formula, thus helping to prevent bleeding gums. The company's sales grew from 1903 to 1905 with the demand for Ipana transforming Bristol-Myers from a regional company into an international success. In 1923 Bristol-Myers' Ipana Toothpaste became a major sponsor of radio programming starting with the The Ipana Troubadors. The Troubadors were a musical variety show and became one of the most well-known dance bands of the 1920's. It was during this period that Bristol Myers introduced the slogan, "Ipana for the Smile of Beauty; Sal Hepatica for the Smile of Health." Despite being advised against animated commercials, In 1954 Bristol-Myers turned to Disney Commercial Studios to develop a new marketing mascot. As a result, an icon of 1950's popular culture was born. 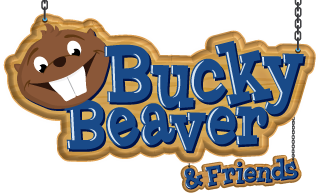 Bucky Beaver was brought to life by Disney animator David Hilberman and was voiced by Mouseketeer Jimmie Dodd. Dodd also wrote and composed Bucky's trademark "Brusha, brusha, brusha" jingle. 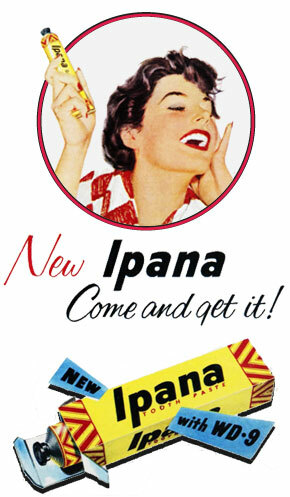 From the 1920's through to the mid-1960's Ipana was one of the best selling and most recognized toothpaste brands in the United States. Ipana's success began to waver in the 1970's when the Bristol-Meyers company shifted its focus to pharmaceuticals. Bristol-Myers brand names such as Ipana toothpaste, Sal Hepatica laxatives and Vitalis hair tonics faded from the company's marketing attention. By the late 1970's Ipana Toothpaste had been discontinued in the United States and quickly faded into history as a childhood memory. 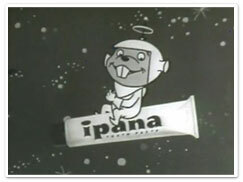 Today, Ipana toothpaste and its chief mascot Bucky Beaver are making a comeback with the help of a Canadian manufacturer of medical and dental supplies, maxill inc. Together they are helping a new generation brusha brusha brusha with 3 new toothpaste formulas, a new line-up ipana toothbrushes and Bucky Beaver Kids Flosser Picks.